Benefit from your own dedicated UK-based Agricounts accountant to support you in 2018. Online accounting software subscription as standard and still up to 50% cheaper than most accountants. we are Agricounts and specialise in small and medium companies in our local area. We understand that every business is different and take our time to understand and get to know each business to ensure we can tailor our approach effectively. We are a friendly and reliable service and pride ourselves on being available to our clients at all times, whether that be in the evenings, weekends or during business hours. With our FREE initial consultation we can get to know yourself and allow you to talk to us so you know exactly what your getting with no strings attached. We are always making sure we are up to date with new regulations and that includes the new MTD (Making Tax Digital) that is soon to come into effect, we have trained with Quickbooks and achieved a ProAdvisor status so we can always be on hand to help with this software while also being able to give our clients up to 50% off subscription for life, this will then be compliant with MTD while also meaning our clients can have piece of mind having there own login and can see what has been done in real time and making it much easier to stay in contact with ourselves. 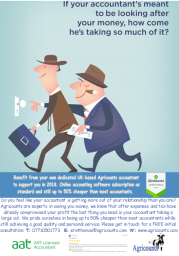 Agricounts are proud to let our customers know that we are up to 50% cheaper than most accountants and pride ourselves in ensuring this never changes. Thank you for reading me email, was quite lengthy so i apologise for that, i hope that you have an opportunity to go through our website and see our great reviews on Yell.com. Testimonials are curated by Agricounts and are not independently reviewed or verified. "Agricounts has done my tax return for a couple of years now and they are so CHEAP! They are about 60% less than my orginal accountant and they saved me tax! Brilliant highly recommend"
"Good, honest, friendly staff made me feel assured my accounts were in good hands." "Quick, efficient & professional. Highly recommend." It was life changing for my business to have found Agricounts, they are extremely low priced, they took the time to get to know my company inside out so they can save me as much tax as they can. I don't know what I would do without them!" Completely free initial consultation at a time and place to suit you, please call or email and we can arrange this no strings attached meeting.